Are you prepared for the next disaster or storm? What does it mean to be prepared? I recently attended a presentation on disaster preparedness sponsored by our local FEMA agency, learning there what I need to do for my household. The FEMA agent explained that their role in an emergency is to coordinate emergency response for larger scale disasters, but they are counting on individuals and families to be prepared ahead of time with enough food, water and supplies to last three days. Listed below are their recommendations. Stay informed. Use your cell phone’s text messaging capability to receive text message updates from FEMA (standard message and data rates apply). The list below is a basic list and may need to be adapted to suit your household. 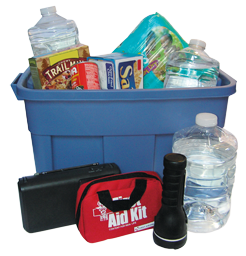 Think about the type of container you keep these supplies in if you need to evacuate your home. When preparing for a possible emergency situation, think first about the basics of survival: fresh water, food, clean air and warmth. In addition, basic services and utilities (electricity, gas, water, sewage treatment, and telephones) may be shut off for several days or longer. Water, one gallon of water per person per day for at least three days, for drinking and sanitation. If you can figure out how to drain your hot water tank into clean containers, you have a nice supply of fresh drinking water. Prescription medications, hearing aid batteries and extra eye glasses. If you are responsible for providing care for someone who is disabled, review the medical supply checklist. For more information, see Ready.gov, Be Red Cross Ready or the Extension Disaster Education Network Family Preparedness course. Wouldn’t it lend a little peace of mind having such a kit prepared? I’m going to get my kit completed before summer. We can help our community weather a storm or disaster much more successfully if every household is prepared. Writer: Shannon Carter, Extension Educator, Family and Consumer Sciences, Ohio State University Extension, Fairfield County, carter.413@osu.edu.